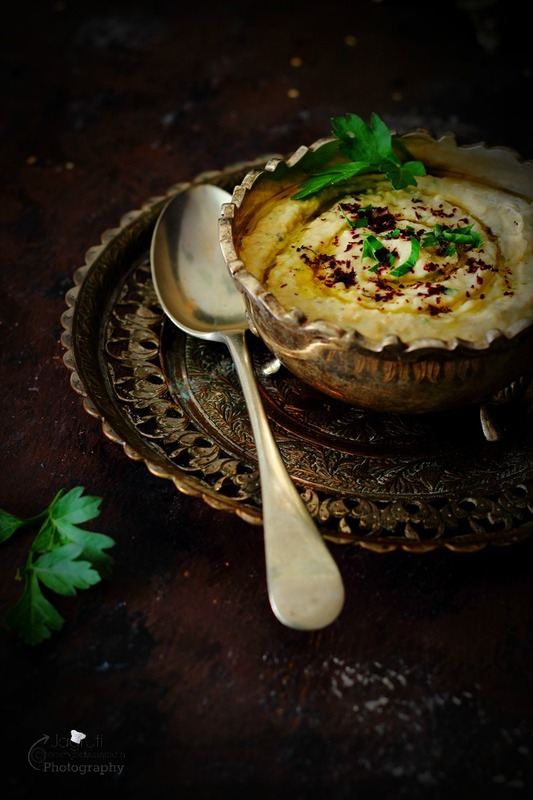 Sumac Hummus - A twist on a classic! 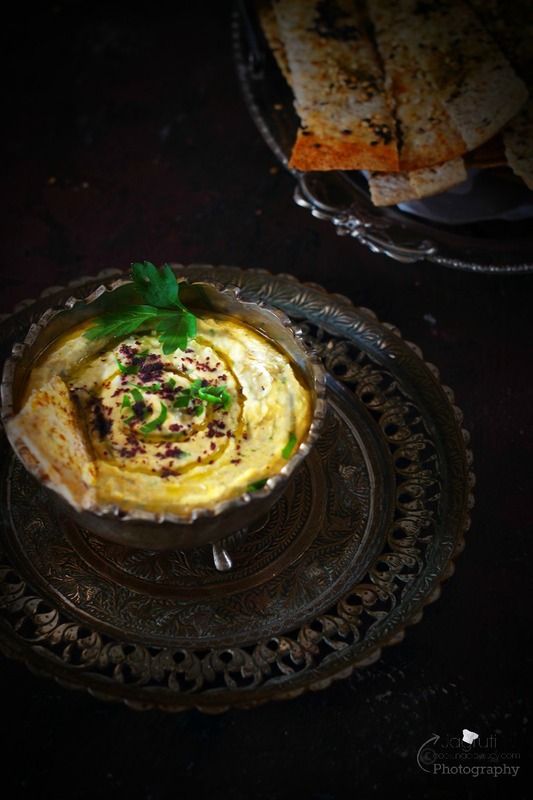 spiced hummus prepared with tangy arabic spice Sumac. 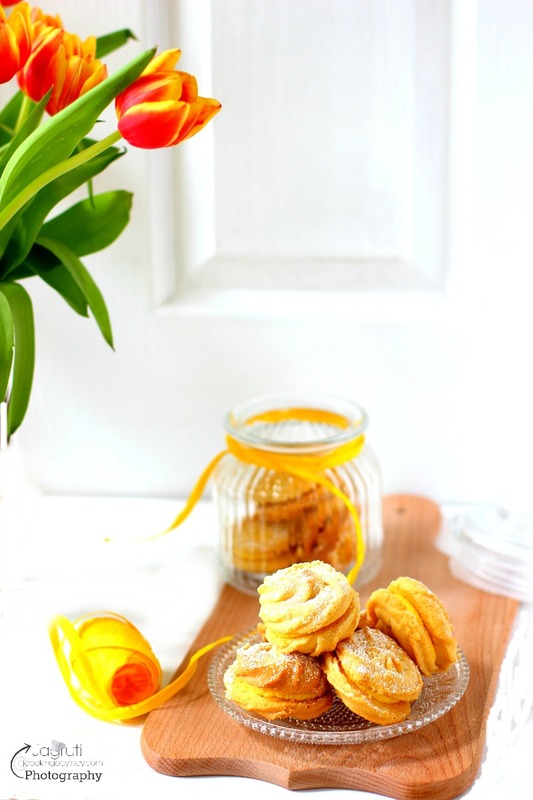 A must try recipe that is so simple and easy to make and delicious to eat. 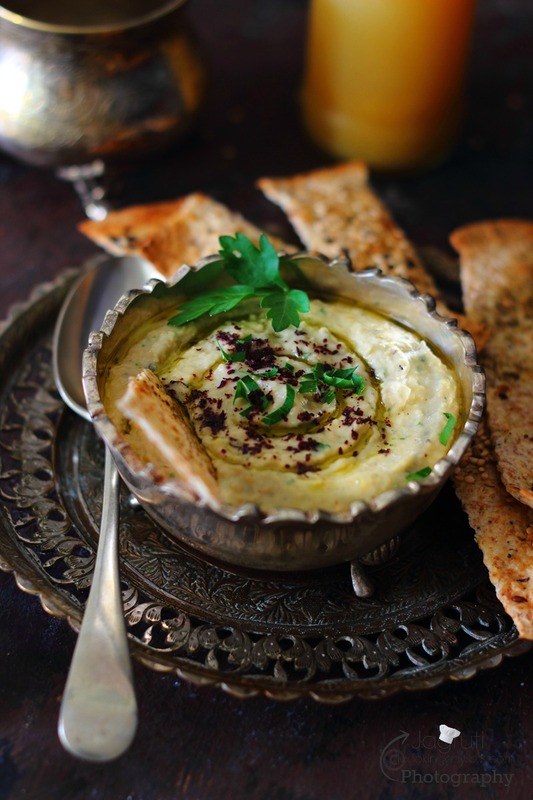 Perfect to go with Instant Lavash Crackers! This summer is going to be a special one for India, and cricket fans across the globe as the sixth edition of T20world cup is already started in India, and the craze can be seen everywhere. As cricket rules the roots of India, and regardless of whether you love it or hate, but you cannot ignore it specially when the cricket world cup is hosted by India and is getting more and more interesting and exciting. Cricket fans all over the globe want their respective nation to emerge triumphant. Myself being of Indian origin, following and watching cricket since my childhood for years and years I always supported team India, I guess we all have love for our country in all of us, however now UK is my first home and being a British my patriotism for England is equal as I have for India. Cricket fever is peaking in my house too, we are all waiting for the nail biting matches which puts the spectators in stance. Oh ! and of course the most awaited match between India and Pakistan, oh yes, no matter what, this match will be biggest highlight of the tournament and the 2016 tournament will be no less than a cracker ! My ideal final would be India V England :) I'll be more than happy if either wins !!! While #WorldT20 cricket matches is on and enjoying so many boundaries, sixes, catches, howzatt and so much drama with friends and family, it's time to munch and relish few snacks and drink. Super exciting matches and finger licking snacks goes hand in hand. 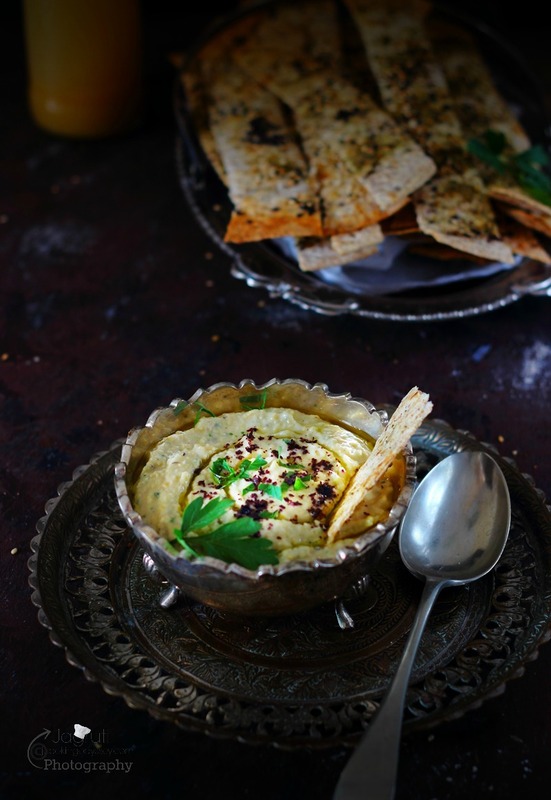 As I said we have been caught up by cricket fever and recently we watched Asia cup finale between India and Bangladesh, I made Sumac Hummus and Instant Lavash Crackers to munch on while we were watching match. I like to prepare snacks which are so easy and also can be made in advance, so I can too enjoy watching match with the family. 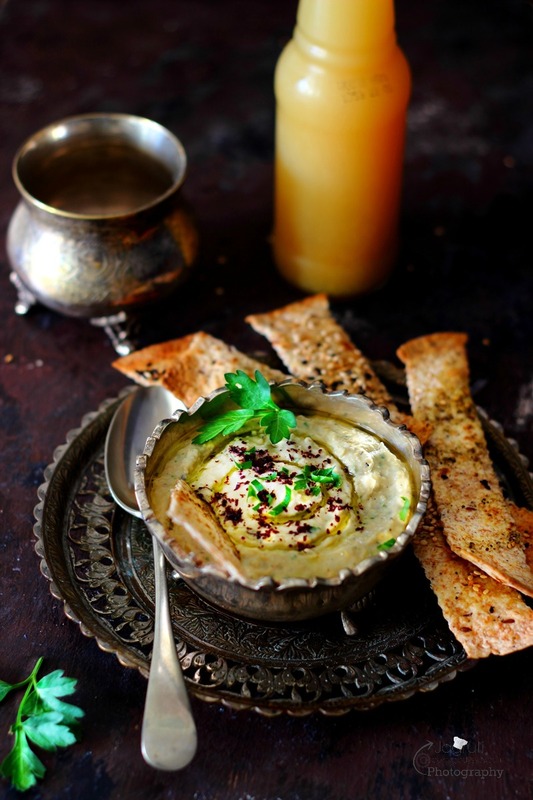 We can have these hummus with either vegetable crudités ,crackers or as spread or just eat it with the spoon. 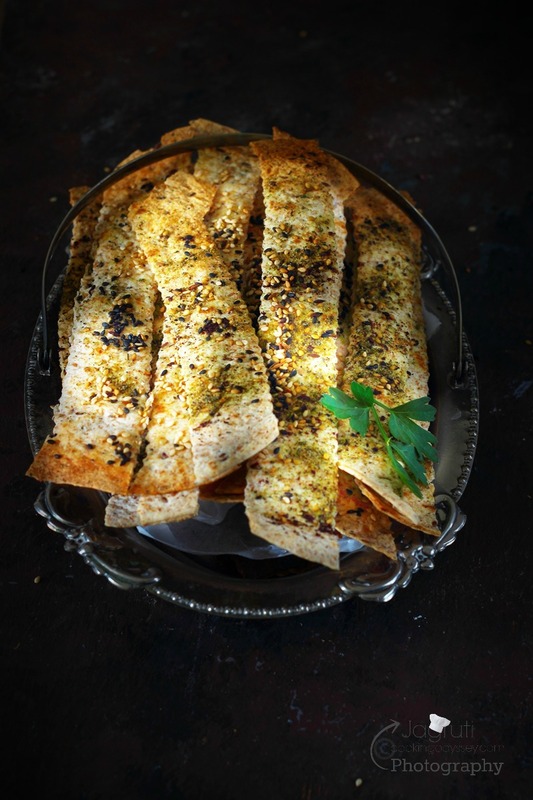 This time I made Lavash or Lavosh, thin ,crispy and crunchy bread which hails from Middle east. Authentic Lavash made from flour, salt and water, sometimes yeast is used too and sesame seeds sprinkled on before baking. 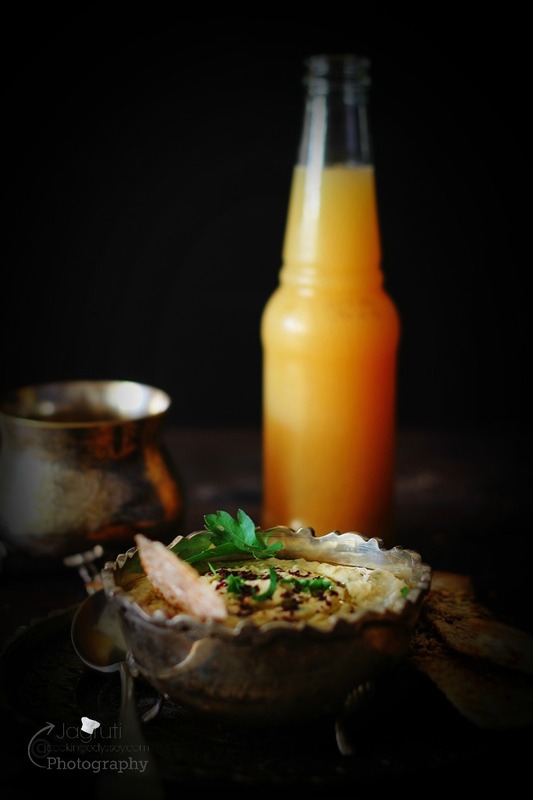 However nowadays I have seen Lavash sprinkled with various kind of seeds, herbs, Cheese and spices. 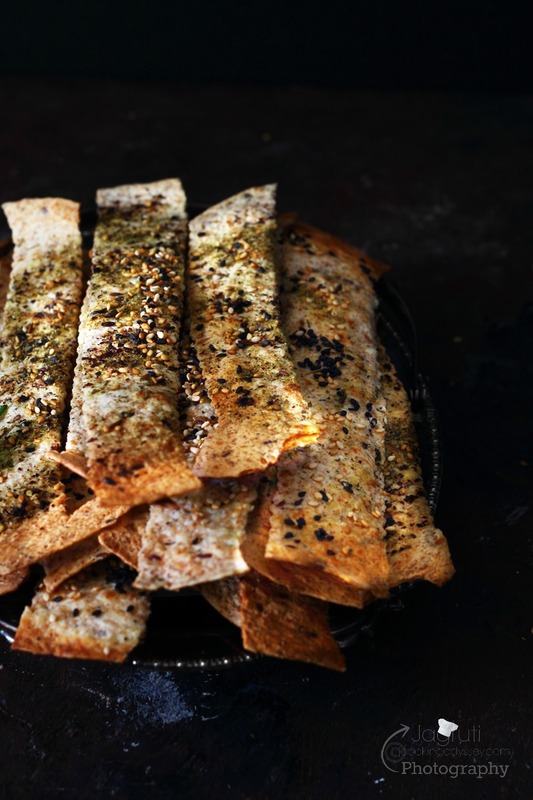 Lavash are delicious as picnic or pre dinner nibble and often served with middle eastern dips like hummus, Baba Ghanoush , Tatziki or with soft cheese. But when you are in a hurry and TV screen on pause, as family members are getting impatience you don't want to be in the kitchen, do you ? Then your brain starts ticking and you come up with a great Instant Lavash Crackers. Okay, one might say it's not traditionally prepared , but definitely tastes great. Also crunchy, spicy and flavourful. I used wholemeal seeded Tortilla wraps, just a little margarine and for topping I used various kind of seeds, herbs and paprika. 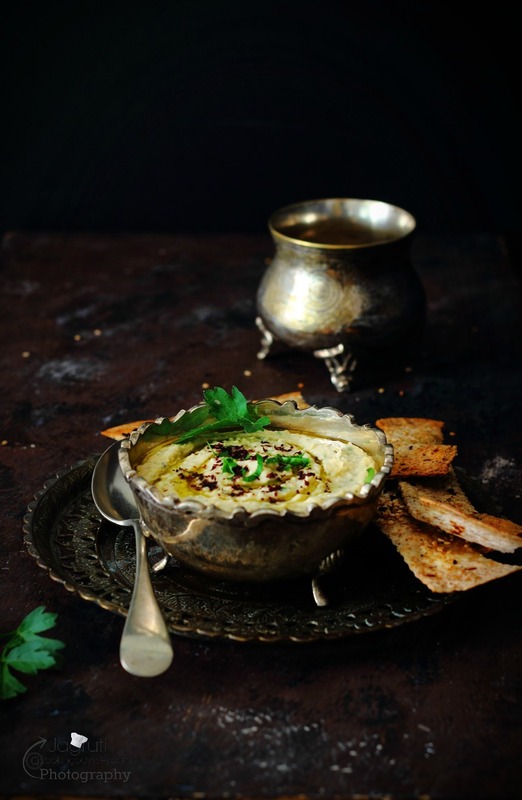 In less than ten minutes we had perfect, delicious and healthy crackers, which we immensely enjoyed while watching cricket match because hummus and Lavash are an excellent snack food to have around when you have a company of friends and family. 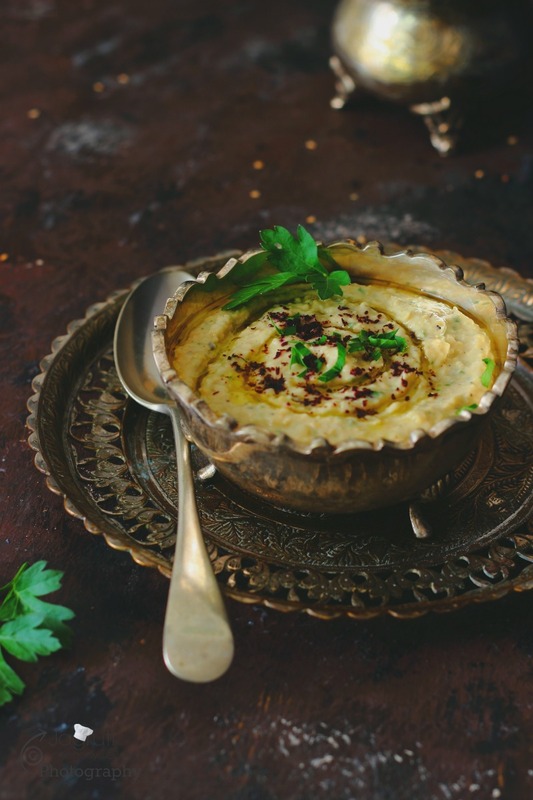 BTW, India won the Asia cup 2016 :) if happens that you too love cricket or your family members and want to munch away snacks like Hummus and crackers, Make right away, or if you want to try something different check out my couple of flavoured and Spiced Nuts recipes. and for topping sesame seeds ( Black and white ) poppy, cumin seeds, few dried herbs and paprika. Take one tortilla wrap, place on a baking sheet and apply very little margarine thinly. Sprinkle seeds, herbs and paprika. Now with using pizza cutter cut tortilla into stripes but not all the way, keep ends together so you still have round tortilla wrap but cut in between. Remove from the oven and let it cool for a couple of minutes, it will get hardened more once it cools down. Place all the ingredients in a food processor or blender jar. Transfer in a serving bowl, garnish with the remaining oil, sumac and parsley. 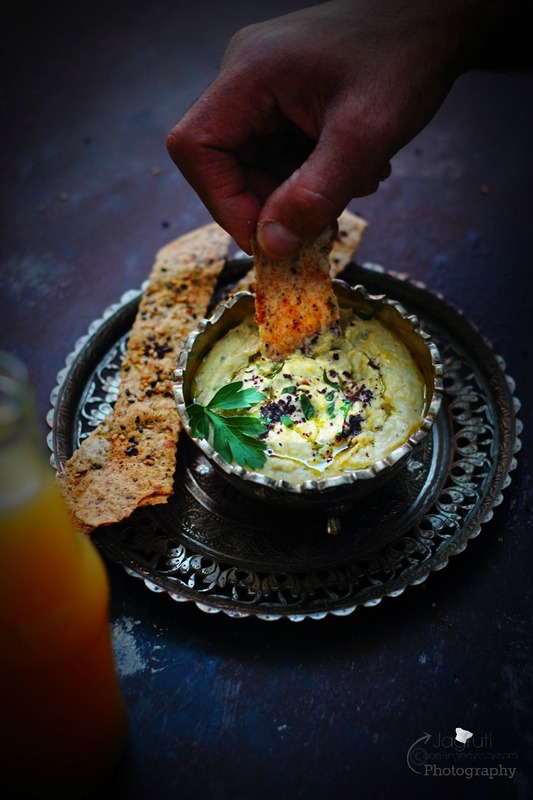 Serve with Instant Lavash crackers or your favourite crackers or toasted pitta bread and veggies for a healthy snack. 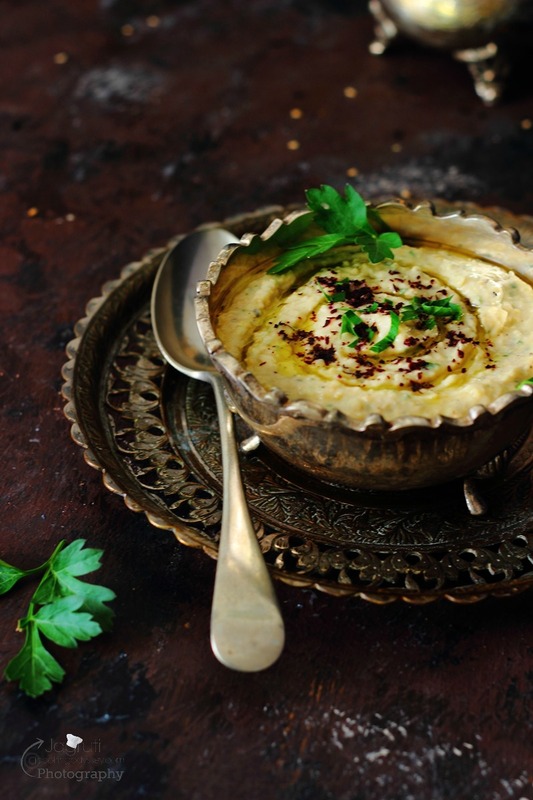 You can store this hummus in a jar up to 3-4 days in a refrigerator.